Beginning to pray is the project of a lifetime. The entry of the Word of the Father into human history makes this project possible. This entry is not convenient or easy for God or man. Love never is. It demands taking up our freedom in the most difficult and most worthwhile of all human endeavors - the effort to attend to and respond to love. Beginning to pray is learning to respond with love to the Living God who has called out for our love as if helpless and completely vulnerable. The Creator of the whole Cosmos speaks to us in supreme humility allowing his His almighty voice to be contained in the hopeful cries of a hungry infant. One does not always hear at first how His invincible will reverberates. For those who persevere in listening for this voice, they hear its harmony resound in the gentle way the the Word made flesh allowed Himself to be encompassed by the frailty of human freedom: conceived and born of the "fiat" of a lowly handmaid, bound by her in swaddling clothes, placed by her in a manger in the cave in Bethlehem. This is what we must attend to in our hearts and respond to with our lives -- God's still small voice is echoed in the plight of those entrusted to us, the poor, the vulnerable and the most needy in our midsts. In this still darkness, "the Visible Image of the Invisible God" speaks into our reality, historical and personal, impatiently awaiting our response. He believes in our liberty so much that He freely chose to enter into it and submit Himself to it. He kisses human freedom with divine freedom - over two thousand years ago in history; today right now in mystery. This kiss cost Him dearly and those who attempt to respond to Him also must renounce themselves, pick up their cross, and follow Him. Yet those who pray pay this price gladly because human liberty raised by grace is capable of love -- and one free thought filled with love of Him is worth more to Him than all the universe combined. The Apostle John fills Christmas with a wisdom that knows what it means to be "beloved" of God. This is an intimate kind of understanding born in friendship for the sake of love alone. His Teacher passed on the discipline of love to him. What he received was no incoherent doctrine or conflicting myth. Rather, he was fed the truth and he ate from the Bread of Life and found it has the consistency of truth, a consistency on which one can stand with his entire existence. Thus, he roots his whole witness to divine love on the Word. The Word dwelling with us, not in mere appearance but in our flesh, this is the context of the Beloved Disciple's message. Gazing on all of sacred doctrine with the analogy of faith, his own writings reach out to the vast horizons of what the Word of the Father has revealed about the love of God that abides with us. Indeed, he teaches as one who has heard, touched and contemplated this Word. From the very first line of his Gospel, the Evangelist draws an intrinsic connection between the saving mystery of the Incarnation,"the Word became flesh" and the work of Creation itself, "In the beginning the Word:" It is this Word who personally and intimately "abides." The Word of the Father remains with us not as an impersonal force imposing the Father's will as if humanity needs to be coerced or overpowered. He is not an ideal extrinsically imposed on our existence from without. He is not a system: the clever invention of the powerful in the heavens above or on earth below to manage our pain, our individuality, our guilt, our dis-ease over death, our yearning for something beyond ourselves. The Author of human freedom has no need to deprive us of liberty or violently rob us of our dignity even as He grieves over its loss. Saint John knows that the Lamb that was slain rules by attraction and invitation. The Risen Lord proposes and offers friendship. The One whose eyes blaze like fire appeals to all that is good, noble and true. The Lord evokes faith so that those who believe in Him know life to the full. This is why he does not need to annihilate evil or surmount our frail humanity. He leads humanity like a shepherd through the valley of death to victory by remaining with us, abiding with us even in the face of all that threatens our lives. The Word is the Son of the Father from the Father and for us. In Eternity, the Son is the Word from and for the Father: conceived by the Father and proceeding from Him in goodness and truth, He communicates all that is good and true to the Father in the Spirit and to the Spirit for the Father. In time, the Word become flesh is sent from the Father and for us: conceived in the womb of the Virgin Mary and baptized by John that we might know the Father's goodness and truth for our own life through the gift of the Holy Spirit. To abide with us as He abides with the Father is the reason He suffered death on the Cross - the Incarnation culminates in the Paschal Mystery. By abiding with us in this way, the Word fills our brokenness with ineffable fullness like light shining in the darkness. To believe in Him is to stake our lives on the proposal that our existence is not an empty accident or meaningless void. Instead, to hold fast to this Word is to believe that everything, even when suffering reduces us to silence, resounds with His fullness. He is the One who loves us and is with us through it all. This is why He does not make our problems magically go away as if they were purely incidental to our lives. Instead, He loves us in these trials, redeeming them, even as our whole world falls apart around us. In this solidarity, He reveals God's decision to suffer the necessary ambiguity our freedom and dignity require. He wills that we might with contrite and astonished heart find our dignity in returning again to Him, He who abides with us. This Disciple who in the shadow of the Cross took the Lord's Mother into his home wants us to know this wisdom, the wisdom of being the beloved of God. He knows that the disciple who surrenders to Christ's particular and unrepeatable love for him, becomes, not God's slave, but his friend. He knows that this kind of faith suffers the abiding presence of God in the Word made flesh even in the face of the Cross. This wisdom, baptized in Blood and Water, beholds the loving goodness of the Father who raises up from death. This wisdom feeds on all that is good, holy and true about consecrated humanity, "My flesh is real food." This Seer of Patmos is a reliable witness. He testifies to the light from above, a light that shines in darkness. In the midst of all the confusion and ambiguities of this world, he proposes that the Lord has entered into the world of our misery, not to annihilate or coerce, but to remain with us in our freedom, awaiting us with love. He enters into our world and into our hearts with tender mercy to be our life. He invites us to say "yes" to the Blood and the Water, to the Spirit and the Bride, to the abiding presence of a love the world does not know. Blessed Elisabeth of the Trinity helps us open our hearts to the coming of Christ. On the twelfth day of her Last Retreat, she offers a reflection on "the Word became flesh and dwelt among us." Jesus has come to give us peace through opening up access to the Father's house. Whoever sees Christ sees the Father, and to see this love is to find that for which our hearts most long. This seeing, this contemplation, this knowledge is by faith. Here, faith is no mere assent to a body of information but a contemplative reality that seeks the saving truth and savors it. Faith is an encounter with the One whom the truths of our faith bear to us, and we believe what the Church proposes to us because we want to know Him. Whoever has surrendered his personal existence in response to the surpassing totality of love revealed by Christ crucified, this soul has gained access to the Father's house, the freedom to go to our real spiritual home, the liberty that leads to our true peace. Blessed Elisabeth sees the peace of Christ through the eyes of Saint Paul. Through the Blood of the Cross, the Lord leads all oppressive "Principalities and Powers" away "as captives, triumphing over them in Himself" (Col 2:15). Without the knowledge of Christ's love, our dignity is vulnerable to all kinds of dehumanizing forces. But with the surpassing love we know in Christ Jesus, we are free from every form of irrational oppression -- indeed, rather than rob of us dignity, the Lord permits all kinds of spiritual hardships only so that we might know the full extent of the greatness He calls us to and makes possible in our lives. What the Apostle beheld in terms of oppressive cosmic forces, the Mystic of Dijon applies to our psychological powers. Our interior battle with ambiguity and darkness in terms of our own patterns of thought and behavior is part of a cosmic struggle where evil powers attempt to overcome the light. Just as Christ has taken diabolical powers captive, He also takes our psychological powers captive so that the ambiguity and confusion the emerges from them no longer robs us of our dignity as long as we persevere in believing in His love. Her application sees beyond the darkness of our interior frustrations to see the limitlessness of His mercy. Beholding the unsurpassable love of the Lord, she understood how our limited powers of imagination, emotion, intuition, cognition and volition often hold us back. Without the Word of the Father, these powers subject us to a labyrinth of fears, anxieties, false judgments because they are subject, not to the truth, but to sin and disintegration. Left to their own, the powers of our soul frustrate that peace for which our hearts truly long. Blessed Elisabeth also knew that Christ has the power to captivate, to hold even our own psychological powers captive. He does not lead our psychological powers by oppression and He is never violent. He attracts. He fascinates. He captivates - because in Him is the fullness of God, in Him all that is good, holy and true about humanity is revealed. His love is that beautiful and she knew this and longed for her friends to see it too. To see this love is to be freed from sin, to be raised up, to be capable of true praise. Techniques and methods rooted primarily in our own powers lack the freedom to achieve moral rectitude and cannot access the peace of the Father's house. Instead, Blessed Elisabeth invites us this Advent to allow our hearts to be drawn into a greater silence and solitude. The surpassing love of Christ is known in our weakness, poverty, and thirst. By humbling accepting this poverty of heart, the beatitude of His presence is ours. Our faith truly accesses God. Instead of attempting spiritual feats of devotion, Blessed Elisabeth invites us to simply surrender to His presence breaking in all around us. To turn our thoughts to His great love is already to lift up our hearts. To waste time thinking on what He has done for us by humbly entering our human poverty, this is already to begin to taste eternity. He is the light in the darkness and the darkness cannot overcome Him. So in the inconvenience and difficult of our poverty and lack of love, He remains, waiting for us so that we, each of us, is awaited by an uncommon love. She invites us to allow ourselves to be captivated: this Word, the Word made flesh, does not disdain humble humanity but cherishes his own birth in its frail freedom. In the Holy Father's latest apostolic exhortation Joy of the Gospel, he takes time to remind us of spiritual accompaniment as a key part of evangelization (see ##169 to 172). Pope Francis begins by noting the paradox of modern culture: on the one hand, people suffer from anonymity, and on the other, a morbid curiosity about the details of other peoples lives. Against these tendencies, the Holy Father is calling the Church, each of us who are members of this Mystical Body, to authentic sympathy. It is vital for those who preach the Gospel of Christ, no matter their vocation, to seek out and find a good spiritual director. When none can be found, Divine Providence supplies in other ways - perhaps through a friend or a family member. We are called each one to follow our crucified master, sometimes in solitude and silence, but never alone. We go forth in a communion of saints, of holy things exchanged between the holy ones of God. This is why the Lord also expects us to make a good prayerful effort to seek out the guidance of someone who will hold us accountable, encourage us to spiritual maturity and help us discern the most appropriate ways to serve God in our lives. God expects us to make this effort is because He prefers to work through those He sends to us, so that we are all bound to one another in charity and mutual support. This bond of love involves a humble disclosure of the heart, an openness to the counsel of another, and a mutual availability to the Lord. It may encompass many other things as well, but this sacred conversation, when guided by the Holy Spirit, is always a profound expression of the mystery of the Church that gives glory to God. The Lord may also ask us to provide this service to our brothers and sisters, if not as a formal spiritual director, perhaps as a good spiritual friend. It is true that priests have special graces in this area, but by baptism, every Christian has been given the gift of counsel, a remarkable disposition by which the Holy Spirit can move us to compassion for the plight of our neighbor, even when this is a deep spiritual suffering. With such gifts, we can rescue another from a sense of alienation and help them raise their eyes to see the wonders of God's love in new ways. My Father, into your hands I commend my spirit. My Father, I place myself in your hands. My Father, I entrust myself to you. My Father, do with me what you please. Whatever you make of me, I thank you. I am ready for all. Your will be done in me, my God. all those whom your Heart loves. I do not desire anything else, my God. I love You and need to give myself to you out of love. I place myself in your hands without limits. Saint Elisabeth of the Trinity is a witness to the primacy of contemplation in the life of the Church and the mystical wisdom contemplation releases into human history. This is the wisdom that understands how God is present in both the public square as well as in the intimacy of our hearts. Today, when the whole world needs this wisdom renewed, the Church celebrates her feast day and invites us to consider her powerful spiritual doctrine. The ultimate end of the divine economy is the entry of God's creatures into the perfect unity of the Blessed Trinity. But even now we are called to be a dwelling for the Most Holy Trinity, 'If a man loves me,' says the Lord, 'he will keep my word, and my Father will love him, and we will come to him, and make our home with him' (CCC 260). This is a rich teaching because it says that our ultimate fulfillment is not simply something waiting for us in a remote future, in a distant afterlife. Instead, the Catechism proposes that heaven can begin now in faith. This means that our faith offers us a fullness of life. We do not have to be content with managing through life's ambiguities and uncertainties with the hope that someday it might get better. Instead, our faith gives us a real foretaste of the fullness that awaits us -- so that the excessiveness of God's love can pour into our lives here and now, if we will believe in Him. To encourage this decision to believe in the love that God has for us in the here and now of our lives, the Catechism cites the beginning of Blessed Elisabeth's prayer to the Trinity, "O my God, Trinity whom I adore, help me to forget myself entirely so to establish myself in you, unmovable and peaceful as if my soul were already in eternity." Blessed Elisabeth's prayer helps us consider what it means to have faith, to believe in God and what He calls us to become. This kind of faith is a matter of a love that takes us out of ourselves. It is, in this sense, an ecstatic movement of heart, a decision to lay aside everything so that there is space for God to dwell in us. Faith helps us see that our own bloated egos need to make way for God. To love Christ to the point of welcoming His word in our hearts means He can begin to help us forget our very self. He is the One who frees us so that the fullness of life that awaits us in heaven begins here on earth. Her words suggest that the biggest obstacle to prayer is not anything outside ourselves, but proclivities within. The ego has its own specific gravity. Its force, if left unchecked, its deadly. Anxieties over our own plans and for security, our lust for control and to put others in their place, our need to be right and esteemed, our obsession with being liked or affirmed, our gluttony for comfort and entertainment; all of this fails to provide any firm ground for rectifying our existence. Unchecked, these tendencies suffocate the heart, and as long as one's heart is pulled by these forces, it can find no peace. Only when we can get out of ourselves are we able to breath the fresh air of friendship with God and true solidarity with one another. At the same time, even after we see how imprisoned we are, left to our own resources, we cannot entirely free ourselves. The answer is not to be found in our own cleverness or in some Titanic effort to surmount oneself through techniques. Only Christ can help us leave our old way of life behind. This is why Blessed Elisabeth's prayer begins with a cry for help. Clinging to what Christ has revealed about the Father and about humanity, this is the essential movement of faith. This is His word to us - for He is the saving Word that reveals this inexhaustible mystery. Those whose hearts are vulnerable to this radiant beauty find true inner freedom. It by standing on this ground that a soul opens itself to God's presence in ever new and surprising ways. On this ground, He dwells in them. With the inflow of His truth and love, it is easy to let go and to trust, and anyone who has discovered this freedom wants to be established there in an unmovable way. Today is the feast of Blessed Elisabeth of the Trinity. She lived out this truth to her last anguished heartbeat, bedridden with an incurable disease even as the political powers of her day threatened those she loved the most and the Church was rocked by all kinds of scandal. This Carmelite Mystic, the Mystic of Dijon, believed her mission was to help souls enter to a transforming encounter with Christ, one that requires a journey out of ourselves where we are vulnerable enough to be touched by Him. Her words encourage us to call out to the Word, and to let His great Canticle of love resound in our hearts with all its fulness -- for to know this saving truth is to live as if already in eternity. One of the influences on the thought and spirituality of Blessed Elisabeth of the Trinity is a Third Order Franciscan widow from the beginning of the 14th Century, Angela di Foligno. Pope Francis has just included this Master of Theology in the Calendar of the Saints and her feast will be January 4. Saint Angela's Instructions #36 contains a description of some of her last experiences and words. Drawing from a translation of this work, Blessed Elisabeth quotes these tender words the dying Angela heard from the lips of Jesus, "It is "I" who come, and I bring you unknown joy... I will enter into the depths of your being." It seems that the Word incarnate spoke to her in this way just before He entered into her in a remarkably beautiful way. She describes that He touched her and embraced her whole being. Even as the disintegration of death was consuming her life, she was enveloped by the love of the Word spoken by the Father into humanity for her, personally, intimately, and truly. For the Mystic of Foligno, the coming of the Word into her was also a very personal event - like the coming of a Bridegroom for his Bride. What a wondrous grace! Even in the face of death, the Word of the Father - the source of all meaning and purpose in creation - enters and embraces the life of the saint so that the meaninglessness of death is not the last word. Instead, at death, she witnesses to being raised into a love that will have no end. It is in this current of love that the Christian takes his stand - because this love gives a life that nothing can take away. Blessed Elisabeth understood how important this encounter with the Word of the Father is. The fact that she would zero in on this passage suggests that something in Jesus's words to Saint Angela also resonated in her own life too. In fact, when she copied these words in a personal letter to her prioress, Blessed Elisabeth was in the physical agony of her own final illness. What a blessing that today Saint Angela's beautiful witness to Christ's personal presence is recognized by the Universal Church. Now, with Saint Angela and Blessed Elisabeth we can marvel at a love that is stronger than death. Beyond every psychological experience in prayer, however enlightened it might be, there is a contemplation of the Gospel of Christ rooted in a whole new outpouring of truth. This ceaseless outpouring of love on broken humanity is always new because the Word of the Father, though unchanging, is never old. His voice echoes with unique and unrepeatable harmony - the harmony that causes all things to be, that saves them from every danger and that orders them all to their great purpose. Though hidden in weakness and vulnerable to every kind of evil, the Word constantly puts the eternal plan of the Father into motion. This is a river of primordial, salvific and heavenly truth flowing in darkness: a true unfolding miracle saving, restoring, rebuilding, raising up, providing, protecting, perfecting all manner of new life. The miracle of hope is born in these waters even as this tired old world is doomed under the weight of lifeless systems and frantic ideologies. Christian contemplation stands in this river and in the flow of its currents, it hears heaven. The most radical of all forms of contemplation of any religious tradition, prayer that welcomes the Word claims the total transformation, not only of created intelligence, but of human nature itself. This is a transformation by glory and for glory into pure and ceaseless praise. Predestined in Christ, in the world but not of it, this humble prayer is unto the praise of God's glory. The new and saving truth such prayer contemplates renews every aspect of one’s life. It does so without harming our nature in any way but instead restores it to integrity and raises it to unimaginable perfection. It is thus a real transformation in which one's unique individuality is not absorbed by some abstract absolute. Instead of surmounting sacred humanity, by the grace of this kind of prayer, one finally begins to live. Here, in all of one own glorious unrepeatability and frail contingency, he discovers the joy of a divine friendship the limits of our present existence cannot contain. Although one's natural capacity for love and knowledge cannot even begin to exhaust the limitlessness of the saving truth revealed by Christ, one's intellect, one's will and one's self-awareness are all raised up into a whole new work by grace. Christian contemplation avails the mind to supernatural operations and makes the very substance of the soul vulnerable to the sanctifying presence of the Eternal Word in the power of the Holy Spirit. Within the limits of time and moments subject to duration, this mental prayer brings to birth eternal thoughts until one’s whole memory burns with hope. It feels the movement of holy desires caused by an Uncreated Love mysteriously at work in depths of heart, depths so deep that one does not know of their existence. Indeed, one's ultimate end is far beyond the power of natural consciousness to grasp. Sharing in the jubilation of God to which ears closed by the disobedience of sin are deaf, this truth based contemplation is cruciform: stretching out on the misery and mercy that collide in one's own heart, drowning all that is false, rash and callous in the abyss of love’s agony while raising up all that is tender, beautiful and noble in pure divine fire. It is a baptism. It is a burning bush. Man’s own psychic energy falls silent before this hidden mountain. It is holy ground on which one may stand only with bare feet. How do we find this secret mountain and how do we enter this hidden garden? The substance of such hope cannot be clung to as long as the mind lusts for religious experience and seeks its rest in its own spiritual achievement. At war with heaven, hubris is a noise that does not avail the heart to suffer the subtle movements of divine power in human nature. The deaf ears of the heart must be rendered vulnerable to the breath of God. Unless it is healed and opened by a truth beyond itself, the mind is unable to catch those triumphant canticles forever singing, thundering, showering, delicately exploring anew all the human mirth and sacred sorrow the Risen Lord pours out on the world and offers to the Father. Contemplation requires sacred doctrine. It is nourished by this real food. It is rooted in this heavenly secret. It drinks from this wisdom of the saints. It stands on what the Spirit and the Bride propose to the world. The teaching of the Church, especially as proposed inerrant and inspired in the Holy Bible, makes possible and safeguards such prayer. Familiarity with the treasure entrusted to us by faith protects prayer from the threat of self-deception and the manipulation of charlatans. Rooted in saving truth, Spirit imbued modes of cognition are free to reach beyond limited horizons of cleverness and enchantment, opening the heart to a divine inflow, a fullness no falsehood can bear. It is the humbled and contrite alone who are both refreshed and made homesick by the kindly warmth of those eternal hymns resounding in the sacred silence of God’s own heart. Raised by grace beyond the futility that clouds intellects still subject to death, such prayer accesses a saving mystery to taste heaven itself and drink from life giving waters. Blessed Elisabeth of the Trinity speaks of a Divine Object that evokes adoration, an ecstasy of love. Pope Francis describes this as seeing through the resurrected eyes of Christ. Saint Paul explains that this living sacrifice, this spiritual worship, results in knowing God’s will, and all that is good, pleasing and perfect in His eyes (Romans 12:2). When we begin to pray, we implicate ourselves in the plight of others, especially those who are suffering. Prayer binds us to offer a cup of cold water to those who are thirsting because prayer allows us to suffer the thirst of God, His divine passion for the salvation of souls. In this way, prayer disposes us to see Jesus in those who are suffering, especially those who most need a reason to hope. If we allow ourselves to be vulnerable to the thirst of Christ, we realize how precious it is to offer our sufferings and to help others offer their own sufferings to satiate that thirst. Mother Teresa believed that many of the sick and suffering would be sanctified much faster "if they suffered to satiate the thirst of Jesus." She had a deep conviction that Jesus was thirsty for souls, that this is the reason when He suffered on the Cross, He uttered the words "I thirst." She had these last words of Christ put behind the altar and near the crucifix of every chapel where the Missionaries of Charity lived and served. When I am honored to pray in one of their chapels, these words are not only a reminder, but also a heart-piercing correction, love's rebuke in the face of my own sluggishness and indifference. In many ways, these words signify the sacred purpose of Mother Teresa and the Missionaries. Saint Teresa of Calcutta also implicated all those this Missionaries served in this great task, especially severely ill and dying. What does it mean for the sick and suffering to be sanctified? Somehow when we offer our suffering to satiate the thirst of the Lord, we make space for God to work in new ways in our own life and in the lives of others. In fact, the sacrament for the anointing of the sick effects this mysterious reality in the lives of the suffering so that in their weakness and helplessness they are established in the very mystery of the Cross, a place of great intimacy with Christ. It is a place of such great intimacy that the Lord allows the suffering soul to extend His saving mystery through their suffering in space and time to the degree that they bear their infirmities with faith and love for His glory. It is faith and love that transforms suffering into something beautiful for God so that even suffering reveals the holiness of the Lord in the world. Today, in hospitals and in hospices, sometimes in households and sometimes all alone, there are those who are overwhelmed by pain and helplessness. Sometimes they are also enveloped in the most disturbing question, and this even to the point of suffering extreme temptations to despair despite their love for the Lord and desire to be holy. There are not many souls in our culture who would dare to accompany the sick through this agony, an agony that thirsts for hope. Yet entering deep into prayer, into intimacy with Christ crucified does not allow us to ignore this plight. It was specifically into this pain that Mother Teresa directed her words "if they suffered to satiate the thirst of Jesus." If we understand the great mystery her words point to, they can become a cup of cold water, a little hope when hope is most needed so that something beautiful might be done for God. The Will of God is a beautiful mystery that evokes wonder and adoration. The sluggish and self-indulgent heart is unable to fall down in adoration because it is asleep to the glory of God echoing through the world. It is only the vigilant heart, the heart that hungers and thirsts for justice, that is ready to welcome beatitude. My heart goes to this mystery this summer as I consider the crucifixion of marriage taking place in our society. Powerful cultural and political interests have imposed their values on the humble and the poor once again. The President and various state governments have acted as good chief priests while the Supreme Court and many other judiciary bodies have all played the role of Pilate perfectly. But they are not the only guilty parties. Each of us, in various ways, great and small, by our own petty sins against the sanctity of marriage and family life, have also chanted crucify, crucify! All this has happened this summer even while holy women and beloved disciples reverently take down the institutional corpse to carry it to its cultural tomb. How could marriage not die laid bear to the hidden violence of fornication, artificial contraception, abortion, and divorce? The faithfulness and integrity that traditional family life demands is not sustainable in the context of our oversexed and banal culture. If petty bickering and mean-spiritedness have always threatened this most holy of friendships, government does not feel obliged to protect these sacred bonds, not even for the sake of children who have a right not only to life but also to the love of a mother and father. So, as authentic marriage is buried in the tomb of artificial and politically correct social contracts, it is right to weep over the fact that something good, holy and true has died in our nation. It is into this mystery that we must take up the task of prayer. God is revealing something astonishing to us if we will only look for it and allow the sorrowful events that took place in our country this summer to pierce us to the heart. It is a matter of compunction. To begin to pray means to allow ourselves to be vulnerable to the wonder of God's Will even in the face of the crucifixion and death of marriage -- because it is only by surrender to His holy and ineffable Will that we glimpse His mercy and allow Him to bring to birth in our hearts unvanquished hope. Wilfrid Stinissen makes an powerful observation in Into Your Hands, Father: Abandoning Ourselves to the God who Loves Us (San Francisco: Ignatius Press, 2011). God's will is disclosed and manifested by opposition to it. This is exactly what happened to Christ Jesus. When He was opposed unto death on the Cross, the mercy of God for the world was revealed. God the Father permitted His only begotten Son to be crucified so that His saving will might be made known. Father Stinissen explains: "God makes use of evil in such a superb way and with such skill that the result is better than if there had never been evil." To see this in relation to marriage requires a certain purification of our faith, a purification that comes through prayer and repentance. The disciples did not start out with a clear understanding of Christ's humiliating death. They began with bewilderment and confusion. We, like them, must not walk away from this experience or try to forget it or attempt to convince ourselves that it is not important. Just as the evil of human acts temporarily blinded the first disciples from seeing the wonder of God's will, our own conversion starts when we allow the Lord to walk with us and question us about where we are going with our lives. Just as Christ's crucifixion was not opposed to anything that God revealed but rather the fulfillment of it, so too the violence done to marriage and family life in our culture is become another way God will reveal the greatness of His mercy. Authentic marriage and family life need God and His ways more than ever -- and the beauty of what God does in the bonds of these holy friendships only shines the brighter the more our culture turns to darkness. Prayer helps us see that in every abuse of power against marriage and family, the Risen Christ continues to be at work in the lives of husbands and wives, fathers and mothers who turn to Him and rely on Him for their strength. Happy marriages and holy families are the result of God's presence in the heart that prays, and not the imposition of politically correct values through social engineering. It was into their shock and lack of faith that the Risen Lord began to disclose Himself to the disciples on the Road to Emmaus. His saving presence and his patient explanations made their hearts burn until they recognized Him "in the breaking of the bread." Likewise, we will only begin to recognize how God is raising up marriage when we contemplate it and beg for it in relation to the Sacred Body and Blood that has been offered for our sake. In the remarkable visions of Saint Hildegard of Bingen ecclesial and sacramental truths are proposed through a vast array of rich images to draw us into new horizons of mystical wisdom. In her vision of the Sacrament of Confirmation, she describes the Holy Spirit as a kind of brilliant lighthouse towering behind the Church. This vision does not shy away from the mission of the Redeemer or the Church through which His saving work is extended. If we will be saved, we must be reborn in Christ Jesus and in this new birth we must live by the light and strength of the Holy Spirit. Saint Hildegard sees the delicate work of the Motherhood of the Church in this context. In a dangerous world in which many Christians live languid lives, the Holy Spirit is the strength of the Church. If there is darkness that constantly threatens the children of God who the Church endeavors to nurture, this darkness is not a defining feature of what the great Saint sees. Instead, standing firm against irrational darkness, this daughter of Saint Benedict beholds a dazzling white tower decorated with emerald trimmed windows in its cone shaped roof. Her imagery is symbolic in both color and form: the tower and the light speak to the transforming strength and enlightenment that constantly perfect the Church's maternal efforts while the white and emerald green suggest the purity and hope that only the Holy Spirit can give. This Doctor of the Church sees the sweet power of the Holy Spirit drawing men and women into a spiritual drama, the battle of all kinds of forces of insane darkness against the glory of God unfolding in the world. The clear golden splendor of the truth pouring through frames of hope is no static image. Nor is the immense lighthouse meant to convey a non-personal force. Instead, the peaceful strength of heaven that the Benedictine Abbess sees towering over Mother Church is a torrent of tenderness from the Trinity. In the Gospel of Luke, as He prepares to ascend into Heaven, the Risen Christ leads his disciples out from Jerusalem as far as Bethany. There He raises his hands and blesses them as His witnesses telling them to go back to Jerusalem to wait for the outpouring of the Holy Spirit. It is in this act of blessing that He departs from them and is taken up into heaven. This passage invites us to reflect on the relationship of Bethany and Heaven. Bethany is not far outside of Jerusalem. It is the town where the close friends of Jesus lived: Lazarus, Mary and Martha. About halfway between Bethany and the old walls of Jerusalem there stands the Church of the Pater Noster. This is where it is believed that Jesus gave his teachings on prayer and it is where the ancient Christians commemorated Jesus's ascension into heaven. This suggests that the ancient Christians made associations between Bethany and Heaven, friendship with Jesus and prayer, the ascension of the Lord and the witness of the faith. What does it mean? One thing that it means is that Christian prayer is a profoundly theological reality. That is, prayer is born of events of great theological meaning in the life of the Church. Christian prayer finds in the ascension of the Lord the reason for its bold access into heaven. If Christ taught we should pray with the bold confidence of sons and daughters, Christian prayer believes it can reach into the heart of the Father because it flows from faith in the Risen Lord whom the Father has raised up to Himself. When Christ was raised up, frail humanity was lifted into the embrace of divinity so that all of the Lord's prayers for us are answered. Through the faith in Him who prays for us to the Father, the world becomes vulnerable to the power of Heaven. But where do we find this faith and how do we know whether the faith we have in Christ is true? How can we know whether our own prayer participates in this theological reality baptized in so much eternal meaning? Such prayer can only be found by those who will freely bind themselves in faith to the Lord through the preaching and teaching of those whom the Lord has sent as His witnesses. The Church, as a communion of witnesses to the Lord who is both departed from our sight but still at work in the world, is the conduit by which heaven's spiritual gifts are brought to bear in the nitty gritty details of our personal lives. It is in the Church that theology, prayer, real life and the friendship we know in the Lord converge with salvific meaning. Although Christ has been raised from our sight, the Church helps us see how He is still at work in the world, coming to us in all kinds of hidden ways to draw us with Him into the bosom of the Trinity. Because Jesus ascended into heaven to send the Holy Spirit onto the communion of the believers, the communication of life and love in the unity of the Trinity lives by grace in the unity of the Body of Christ On the basis of His faithfulness to us before the Father, the prayer of the Church claims bold access to the transforming power of heaven so that every Christian can pray with confidence in Him even though He has been taken from our sight. The witnesses to Christ death, resurrection and ascension into heaven safeguarded their message through the teaching of the Church. This sacred doctrine preserves for us today the saving truth by which our faith accesses the inexhaustible riches of God, treasures from the Father Christ yearns to share with us. What a great obligation teachers and preachers of the Gospel have! Entrusted to them is the witness by which the confidence of Christian prayer is discovered. Yet to provide a reason for this hope, not only their teaching but also their lives must be true. Such a task is impossible for alienated humanity. They too must enter into the confidence of prayer if they are to pass on the witness to Christ the Church has entrusted to them. In these ways, the Ascension of Christ helps us see that prayer and sacred doctrine, the saving events and the communion of the Church are all bound together in our faith. While many Catholics might approach prayer as a private and emotional exercise for rare moments instead of ecclesial and theological act we should make unceasingly, such spirituality risks being cut off from the source of confidence that lives in our tradition. The greatness of Christian piety alive in the Church is glimpsed only as we accept the sacred doctrine the Church proposes in her witness to the Risen Lord. Prayer, faith and friendship are joined in the Risen Christ who chose His Bride as His witness. She knows He is departed for awhile but ever present in the Holy Spirit. She reminds us that He is raised into heaven out of our sight yet His loving gaze never loses sight of us. She helps us remember that even though He has gone to the Father, His blessing never leaves us. It is when we make every effort to welcome and safeguard this treasury of truth that the prayer shared by those whom the Son of the Father bound together as his friends and witnesses becomes our prayer too. Thanks to the tireless efforts of Daniel Burke at Roman Catholic Spiritual Direction, I will provide instruction in an online program in spiritual theology hosted by the newly founded Avila Institute. Courses include online, live and interactive graduate level lectures with the option of participating strictly to enrich one's own spiritual formation. I am particularly pleased that this course of studies includes an international outreach, especially for those who might not otherwise have an opportunity to engage this vital conversation in the life of the Church. Application for admissions can be found here. Your prayers for this project and all those who participate in it will be greatly appreciated. Is it possible for suffering to be delightful and for pleasure to be wearisome? Although the dominating cultural voices of our time believe this to be psychologically unhealthy, St. Catherine of Siena asserts that this is a normal experience for God’s most beloved children. Her reasoning is simple, they love the Cross because, like God the Father, they love the only begotten Son of God. Saint Catherine is not promoting the morbid idea that we should love just any kind of suffering for its own sake. There is lots of unhealthy suffering in the world - all kinds of misery where love is absent. The suffering of the Cross in which those who love God delight is really an "anguished love", and not the suffering brought on by self-indulgence, self-pity or self-loathing. How does she look at this self-centeredness? It is a tragedy over which we should weep for one another. This is because she sees selfishness over and against the great purpose for which we were made. We are meant to minister the bright warmth of the sun, but selfish love makes us dark instead. This description almost anticipates what astronomers today call "black holes." Saint Catherine describes this lack of self-knowledge as a matter of eternal peril. Without the liberating self-knowledge that comes from God, self-love is such a trap of rash judgment that it renders us incapable of loving those entrusted to us. We are callous to the poor and to all those God loves unless we humble ourselves and turn to the Son of the Father. In response to our selfishness to God and the those He loves, the Father gives us His Son on the Cross. The Father yearns for us to reach out to the Cross of Christ where alone we find the freedom of the His love for us and freedom from ourselves. For her, the Holy Cross is always the bridge from the alienated misery of sin to the merciful love of the Father. It is on this bridge that we become familiar with Christ, that we confess our sins and come to feast on His Eucharistic banquet. In the Eucharist, this bridge becomes a table. It is a feast of faith which establishes real communion with the Lord in our lives. The more we partake of Him by faith, the more we are taken by Him in love. A desire to share completely in Christ is born in the soul. Nourished by the mystery of the Cross, she puts into the mouths of such souls the words of St. Paul, “I glory in the hardships and shame of Christ crucified” (see 2 Cor. 12:9-10). The references to "children" in this passage are not merely sentimental terms of endearment, but they have theological weight in the broader theological tradition. The attitude of trust in the face of suffering implied in this passage really is the attitude of a child, the kind of child the Lord declared would inherit the Kingdom (see Luke 18:17). Saint Catherine's spirituality is marked not by great achievements of psychological gymnastics. Rather than elaborate systems of meditation, the prayer she advocates is humble, a simple movement of the heart to the Father. Such prayer is commensurate with the faithful remnant of God's people, the persecuted who hope in the Lord. The Father judges these suffering children, these anawim, these lowly and despised as “very dear.” There is something in this that anticipates the “Little Way” of Saint Therese of Lisieux. If the humble suffering of His little ones is exalted above pleasure by the Father, it is because He judges these things in relation to His crucified Son, the One who offers fallen humanity the bridge to His mercy. One notes throughout the Dialogue that the Father's condemnation of sin contain almost a reluctant note: His desire that sin should be punished is always secondary to His hope that the sinner will come home. The Father sees the whole drama of sin through the obedience of His Son, His Word, His Eternal Utterance from which all things come and in which they find their ultimate end. Furthermore, the Father's hope for His children does not stop with their liberation from sin: He also wants them to have the joy of sharing in His Son's work of redemption. If the Father finds His rest in His Son, it is because the Son knows the peace of perfect obedience, the suffering obedience of love. The Father longs to see the obedient love of His Son at work in his beloved children. This is how they will participate in His Son's redemptive work. Obedience - to welcome another into one's heart so that they might find their rest there. This means tenderly accepting the will of another into one's own heart. It is treasuring ones neighbor's desire as one's own, to allow the pain, the joy and the plans of another to define one's life out of tender love. This vulnerability of heart is rarely possible between sinful people and that is why, instead of obedience, we relate to one another in different forms of submission or rebellion. In contrast, the divine suffering of obedient love in our humanity reveals the very life of God. Saint Catherine personalizes this truth: since the Father rests in His Son's love, the Father also rests in those who are animated by the anguished love of Christ, “I am always at rest in their souls both by grace and by feeling.” (The Dialogue, 78). The hope of conversion lives in these lines. It is a call to come to our senses. The soul in which the Father rests no longer allows itself to suffer self-indulgence, self-pity or self-loathing. The Eternal Father is not content with sin. That is why He sent His Son, to free us from these dehumanizing burdens that we might be raised up, that we might realize the greatness of our humanity. For Saint Catherine, Christ frees humanity from sin by setting hearts on fire with charity, “The fiery chariot of my only-begotten Son came bringing the fire of my charity to your humanity with such overflowing mercy that the penalty for sins people commit was taken away… There is no more need for slavish fear” (The Dialogue, 58). Those who welcome the flaming chariot of God’s Son – humanity on fire with divine love – soon discover that their own humanity is on fire too. Burning with the suffering love of Christ, pleasure, security and power no longer drive them. They are content with suffering all kinds of inconveniences and hardships for the sake of Christ (and for those entrusted to them) because they are driven by the fire of the Father’s very charity Christ’s burning humanity has brought into our own humanity. When there is no fear of death, suffering takes on a different meaning, and men and women find the freedom that sees hardship through the eyes of God. If the Father contemplates hardship through the lens of the Cross, then, when we cross this threshold with Christ, we gain an invincible perspective. Bound to Christ, we find ourselves bound to one another in suffering love, a love that suffers anything that the dignity of one's neighbor might be protected. United to our Crucified and Risen Master, fear of sacrifice melts away before the burning fire of divine mercy and tender friendship. This is the perspective Saint Catherine invites us to share when she describes souls that find pleasure wearisome and rest in suffering. To be nourished with divine love is to find a courage that lifts us above our own nature and the self-centeredness to which it is subject. In the face of the fear that inhibits our nature, this fear of not being able to save ourselves, this fear of losing ourselves, Saint Catherine shows us, through the eyes of the Father, how communion with Christ crucified infuses our hearts with the audacity of anguished love. The passages from The Dialogue come from Catherine of Siena: The Dialogue, translation and introduction by Suzanne Noffke, O.P. with a preface by Giulliana Cavallini, Classics of Western Spirituality, New York: Paulist Press (1980) 112, 144-145. Since I have been invited to post for Roman Catholic Spiritual Direction, I have been in conversation with friends and students about continuing the mission of this blog -- which is meant to encourage a new beginning of prayer in our lives. Prayer does not offer an escape from trials or the difficulties of our time - it offers a way to face them with hope, the hope we have from God. To help keep this important discussion going, we will be blessed by several different guest bloggers from a variety of different walks of life who offer their reflections to this end. My portion is not a small part of something larger. My Portion is All. My portion is my Creator and my Savior. He cannot give only part of Himself to me. He cannot divide Himself. He gives generously. He gives all. Yes, my portion - set aside specially and specifically for me - it is the Lord. He has given all for me on the Cross and He continues to give all to me in the Eucharist. He does not share only part of Himself, He does not hold back a portion of Himself from loving, from expressing His love for us. The Eternal Spirit was even willing to limit Himself within skin and bones to show me His love, to touch me in love. And He continues to humble Himself, to give Himself to us so vulnerably in the Eucharist. Therefore, I hope. I hope when my mind says I shouldn’t. I hope while the tears run down my cheeks. I hope when I cannot hold back the sobs of disappointment, grief and exhaustion. Even when I doubt, my souls sings “my portion is the Lord." I cling to this truth. The song is written in our hearts, whether we hear it or not, whether or not we can see the notes to sing along. The thoughts can crash so loudly that they drown out the song of the soul, and so I must work to remember. I struggle within myself to remember the beauty of the song when my intellect does not understand, when my emotions overflow with anguish. The cup I drink from at the moment may taste bitter, it may burn as I swallow down the contents of the day, of the moment, but my portion is still my God and He is good. No matter what I feel, what I see - I know that He is good. He is my portion, and so I am able to hope, so I choose to hope even when I feel hopeless. I decide to hope when my thoughts assail me with doubts, with grief. My soul has known the Truth, the Truth that has and will continue to set me free. My soul hopes and savors the memory of the Portion who is All. My Portion, my All, the Three-in-One and One-in-Three. Thank you, Lord, for being my All, my Generous Portion, my Hope. How do we pray in the face of grave evil and personal disaster? Often grave evil has a stifling affect on prayer. One feels overwhelmed and helpless. In this despondency, the mind struggles to search for God's presence, if it struggles at all. In the face of unexpected disaster, the crushing burden of difficult questions torments the soul. Yet, the world in which we live and in which we pray has always been riddled with the mystery of grave and overwhelming evil. How do we begin to pray when God's love seems so absent and the reason for our hope so difficult to affirm? Sometimes it feels impossible to pray and prayer is reduced to its most essential and simple movement - the cry of the heart for mercy. On this point, Pope Emeritus Benedict's Spe Salvi refers to Cardinal Nguyen van Thuan's experiences during his long internment in Vietnam (see #34). Sometimes, there was nothing the Cardinal could offer from his heart and all he could do was repeats passages from Scripture or prayers he memorized. I have also spoken to those close to death who complain about the same kind of difficulty in prayer. They want to want to be able to pray - but there are no words, no thoughts, no feelings, nothing to intuit, nothing to imagine, nothing. In such moments, God seems so absent and in effort to pray, if effort can be made at all, seems so wasted. So they repeat simple short phrases they have memorized, "now and at the hour of our death" or else "our hope does not disappoint" or even "Jesus, Jesus, Jesus…"
In such cases, all that is left to the soul seems to be a sort of last vestige of prayer, a feeble desire to raise one's heart to God, a desire hidden in the overwhelming pain that, in this moment and under these circumstances, cannot realize fulfillment and yet chooses to hope anyway. It is an effort to pray or to desire to pray baptized in heartbreak and dismay -- and in this annihilation, we have already entered deep into the infallible prayer of Christ Crucified. Who is not reduced to this kind of prayer when the mystery evil crushes the innocent and vulnerable? When we learn about a friend's daughter paralyzed after a fatal accident, when we learn about explosives killing people at a foot race, or when we learn about the horrific slaughter of babies who having survived callous attempts to abort them were subjected in the most inhumane brutality, it is difficult to pray - the heart is numb, but not our hope. When the simple words of the Our Father, a Hail Mary, or even the whispered name of Jesus is all that can be offered -- this is what the Lord needs us to offer and this with what love we can muster: for even in the poverty of our prayer, the most frail effort to pray makes space in the world for God to act. So we find the courage to pray. The power of God is at work in so many hidden ways that, even when our conversation with the Him is reduced to nothing else than the most humble cry of the heart, the Lord unleashes anew that flood of hope that helps the world begin to see the triumph of good over evil even in face of heart-breaking circumstances. Happy Divine Mercy Sunday 2013! Divine Mercy Sunday reminds us of the truth on which the whole Christian life stands. Although internal and external politics in the life of families and nations seem overbearing, actual conflicts or any potential strife do not ever have to consume the meaning of our lives. There are deeper and more powerful forces at work in the course of human events, even in the course of our personal lives. 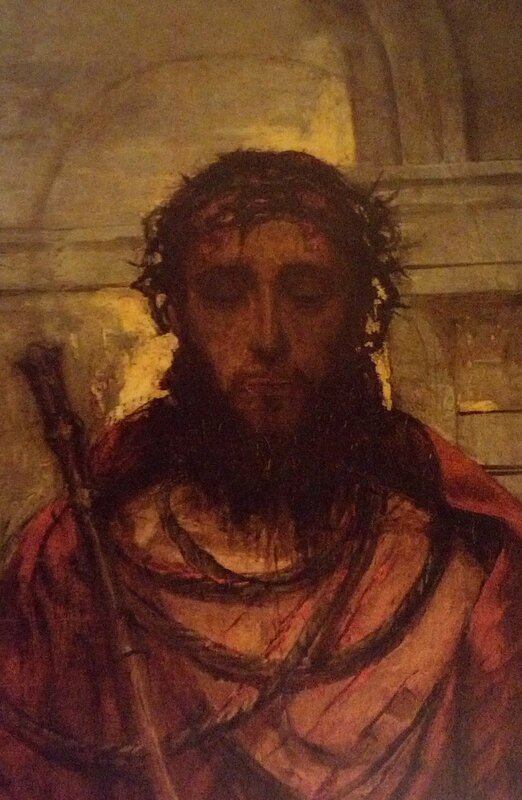 In the radiance of the face of the Risen Lord, the merciful love of the Father waits to be discovered by faith. After two millennia of searching these vast frontiers, the Church has yet to fully plummet the inexhaustible riches are Christ. Indeed, for all our efforts in this noble task, we have only scratched the surface of all that God has in store for those who believe. In the unbridled inflow of God's presence in the world which the Lord continually makes known, we have reason for great hope. May this great celebration of merciful love be a blessing for you and your family -- and through you for the whole world. For a little background on this great feast and the Holy Spirit - click here. For some thoughts on this celebration and wisdom of heart -- click here. The resurrection is a mystery of the triumph of divine mercy over human misery. When the Father raised Christ Jesus from the dead, humble humanity was not overcome, surmounted or diminished. Instead all that is good, holy and true about this life was rescued from futility and death. Christian contemplation beholds this victory and by faith allows the splendor of Easter morning to baptize the soul anew. Th prayer of faith sees the resurrection of Christ from the dead has the first fruits of an astonishing work of God. The Risen Lord animates this work of new creation as a fountain of grace, a boundless source of divine love flowing into our parched hearts. Those who drink from these living waters are no longer prisoners to the dying life we now live. Humble prayer drinks this in and discovers the hidden fruitfulness of God. Just as Jesus rose from the dead, Christian prayer rises up in faith. To believe that Jesus is risen from the dead, this is to lift up our hearts to the Lord and take our stand on the firm ground that knows evil is not the last word about our lives. This faith may well be tested by our mediocrity and repeated failures, but if we do not deny Christ, He will not deny us - instead His faithfulness to us is being revealed in our struggles to be faithful. The Risen humanity of Christ is the very yeast of prayer so that even in the depths of our most bitter struggles, prayer rises to God. By His passion and death, Christ sewed into the mystery of sin, the mystery of grace. The mystery of grace makes all things new so that even when we fall short, turning to the mystery of Mercy we can always make a new beginning. In this work of grace, it is God's inexhaustible love and not our failures that defines who we are. He continually lifts us up. Prayer is all about grace, the grace that flows from the wounds of Christ. This sheer gift entrusted to humanity can only be welcomed in humble faith. It is the gift of the merciful love of God at work in us. Prayer ponders the dimensions of merciful love, a suffering love pierced to the heart over the plight of another. God is pierced over the plight of each one of us. This is why He could not bear that we should suffer alone. To show us how much He has implicates Himself in our misery, He suffered death on the Cross for us. So that we might know our dignity, our freedom, the saving truth about who He is and where we stand before Him, Christ drained to the dregs the cup of our misery, treasuring each drop because He treasures each of us even more. Prayer is the response of a heart that is moved with gratitude for this inestimable gift and, in this gratitude, opens the heart to be like God's - pierced by love. Christian contemplation takes all of this in by faith. In the dawning of the Third Day, we come to know how no sin, no addiction, no shortcoming, no weakness, and no other burden of guilt can overpower or exhaust the love of God at work in those who believe. This suffering love is the truth and this truth is what sets us free. Even when believers allow themselves to fall back into the slavery of sin, the very thought of this new freedom stirs a longing to return to the life of faith. This is a holy freedom filled with God's ineffable freedom, a freedom to turn back, to reverse course, to rediscover the embrace of the Father. It is a freedom that is expressed in conversion from sin and renunciation of anything that threatens our dignity as sons and daughters of God. It is a freedom to seek the goodness and mercy of God yet again. To pray in this freedom is to keep vigilance with the eyes of the heart so that with every breath, in every moment, we might gaze on a love so much stronger than any form of slavery or even death. A new life blood animates the spirits of those who live by such contemplative faith so that even when they suffer death, the life by which they live only becomes stronger. Here, precisely because they are more fully alive, their praise becomes all the more beautiful. Unfolding in all kinds of astonishing ways throughout space and time in the lives of those who put their trust in the Risen Lord, this illuminating work of love brings the only thing really new our old, tired existence has ever known. Here, prayer that lets itself be captivated by the freshness of merciful love ponders a true word of hope for a discouraged world. Christian prayer extends through the vast horizons of love pioneered by Christ into human poverty. The mysterious prayer of the Lord, a prayer that implicates the whole of his sacred humanity in merciful love, effects radical vulnerability and complete trust in the goodness and wisdom of the Father's plan in every situation, no matter how difficult. Here, the prayer of the Word made flesh is not merely an example for us to follow. His prayer is a new principle that animates the cry of recognition and love that lives in the Church and resounds throughout the cosmos in every trial, suffering and joy. For Christians, the ancient rites of Passover and the Passion of Christ are deeply connected. To deliver the People of God from slavery in Egypt, God sent an angel of death, a great power that stole from families the lives of those they deemed most precious. To protect His own People from this destroying angel, He commanded the Hebrews to gather as families, slaughter a lamb and to sprinkle the blood of this lamb on the doorposts of their homes. Seeing the blood, the angel of destruction passed over the homes of those who belonged to the Lord. In the tradition of Christian prayer, this sprinkled blood foreshadows the power of the Blood of Christ signified by the Sign of the Cross. So much did the early Christians connect their faith in the Blood of Christ with that of the saving events of the Passover, St. Paul explains, "Our Paschal Lamb, Christ has been Sacrificed" 1 Cor. 5:7. The Gospels explicitly connect the sacred rites of the Last Supper of the Lord with the Passover celebration. There are also other theological contexts connecting the sacrifice of the lamb with the Cross of Christ. (See Mark 15:25-37.) In the Gospel of John, according to St. Augustine in Tractate 117, Jesus dies on the Day of Preparation for the Passover, the day on which lambs were slaughtered for the celebration of passover (See John 19:14). The diversity of these Scriptural traditions is symphonic, speaking to the inexhaustible horizons of the Lord's saving work, a mystery so vast and beautiful the only proper response is thanksgiving (eucharist). Whenever we prayerfully reflect on the beautiful connections of our salvation prefigured in Exodus and fulfilled in Christ, our hearts are made vulnerable to the vision of the early Christians. Their vision was filled with wonder over the blood of the sacrificial lamb and what it revealed about the Mystery of the Cross. They marveled over how the blood that was shed in ancients rites foreshadowed the Blood of Christ they received by faith and they rooted their worship in this contemplation. "The Passion of the Christ was prefigured by the Jews when they received the command to mark the doors of their houses with blood. It is by the sign of His Passion and Cross that you must be marked today on the forehead, as on a door, and that all Christians are marked." St. Augustine, De catechizandis rudibus, as cited by Jean Danielou, The Bible and the Liturgy, Ann Arbor: Servant Books (1979), 167. St. Augustine is connecting the ancient rite of sprinkling the blood of the lamb, a saving sign for the Hebrews enslaved in Egypt, with the cross that is given in the baptismal rites, a saving sign for those seeking freedom from sin. Before baptism, the Church entrusts the Sign of the Cross to the chosen catechumen by tracing a cross on the forehead with the Oil of Catechumens. This ancient Christian rite is continued in our Catholic practice today. Those who receive the Sign of the Cross (sphargis) through this anointing are safe from demonic attack in a manner similar to the way ancient Hebrew families were saved from the angel of death. The blood of God, the life of God, is more powerful than evil. "There is no other way to escape the destroying angel than by the blood of God, Who by love has poured out His blood for us. And by this blood, we receive the Holy Spirit. Indeed the Spirit and the blood are related in such a way that by the blood which is connatural to us, we receive the Spirit which is not con natural, and the gate of death is closed to our souls. Such is the sphragis of the blood." Paschal Homilies of Pseudo-Chrysostom as cited by Jean Danielou, The Bible and the Liturgy, Ann Arbor: Servant Books (1979), 166. Making the Sign of the Cross is like covering ourselves in the Blood of Jesus. Whenever we make the Sign of the Cross with devout faith, we are renewing our baptismal commitment and the Lord communicates His life to us in new and unimaginable ways. This Sign of Victory plunges us into the saving power of God foreshadowed in the Exodus. In a world of all kinds of slavery and death, this Sign of Freedom reminds us that God has intervened. This Sign of Salvation proclaims to all principalities of destruction and powers of darkness that God Himself has implicated Himself in our plight and helps us remember that we are never alone -- no matter how difficult or dark the circumstances we must face. This Sign of Hope renews our faith that the saving power of His Blood is such that no matter how intense the struggle, no irrational force in the heavens above or on the earth below is able to surmount the love of God. Through renewing this Seal of our Hearts, the heart covers itself again with the Blood of the Lamb so that even in death it knows Eternal Life. Since prayer in the Catholic Tradition is concerned about real life, as were the teachings of the ancient prophets, there are political events that have such spiritual significance they cannot be passed over. In fact, the reality of Christian prayer extends to everything to which the dimensions of Christ's love extend - even the socio-politico. I read Archbishop Aquila's statement in response to Senate Bill 11 which you plan to sign. I have also read Bishop Sheridan's statement in the Colorado Catholic Herald. It is disappointing that their concerns remain unaddressed. When my own local government seeks to impose inhumane values that are abusive of institutions so sacred as is marriage and the care of orphans and children in distress, I feel compelled to use this platform to make my voice heard in the public square and in the marketplace of ideas. After having attempted to reach you by phone, I address you in this open letter today as we Catholics celebrate the solemnity of St. Joseph, the foster-father of Jesus Christ and protector of the Holy Family. You plan to sign into law legislation, a so-called civil unions bill, that by design obscures the ancient meaning of marriage and penalizes those who are morally obliged to safe-guard sacred truths about humanity. Indeed, those who have devoted themselves to works of mercy out of love for God must care for orphans and children in troubled family situations by divine decree. By the action you are intending to carry out, you will rob them of the freedom they need to follow their consciences in trying to find good homes for those who do not have any. Those who have supported this bill have pitted themselves against people of good will, families, and children whose God given rights have already been brutally abused in this conversation. Should you go through with what has been announced, more than catastrophically harming the very heart of our society (marriage and family life), you will also define yourself as an enemy of the most fundamental liberties essential to the American experiment - including the religious rights of citizens to organize to provide orphans foster care or adoption into families that have both a mother and a father. As a life long student of the religious dimension to human existence, the legislation on your desk can only be seen as one more effort by government to seize divine power it simply does not have. Whenever the politically powerful attempt to exercise such absolute tyranny over those whose rights they should protect, the dignity of humanity is always put at grave risk. In fact, should you make this legislation into law against the will of the people of Colorado who already rejected a similar referendum and amended our state's constitution to protect marriage, you will implicate yourself in a form of political idolatry that can only undermine our solidarity as a people and your credibility as a statesman. This does not have to be the road you choose. Appealing to your own desire that the citizens of our State might thrive, please remember that we come to enjoy the fullness of life when we make decisions mindful of that day of reckoning in whose merciful but exacting light your actions as governor and each one of us entrusted to your service will be scrutinized. The tender but challenging truth suggested in these three simple ideas fills my soul: to prayerfully walk in Christ's presence whereever it leads, to build up the Church with the Blood of Christ no matter the price, to confess the glory of Christ crucified with every fiber of strength God has given us - this is life to the full! There is so much more to say, but for now, this close to Easter, it is good to think about the essence of His message, his invitation to have courage together before the mystery of the Cross by the blood of Jesus. This is the way forward for the Church and for each one of us personally. The blood of Jesus - fountain of our salvation! My heart goes here because it helps me realize how much the Lord has loved us and the power of the life He gives us. Because Christ has loved us with a love that is stronger than death - we have hope even in the face of our failures. But there is an implied challenge in these words - to the degree that our hearts remain hard, that we will not repent, that our lives are unconverted by the love revealed by Christ Jesus, we have not fully welcomed the gift of our redemption - and only those who welcome this gift can enter deep into its saving mystery. As the Holy Father preached today, God is so merciful that the problem is not that He will ever stop extending His forgiveness to us - but we might stop asking if we allow our hearts to be hard to his Word. If we want to be disciples of the Son of God, those who hear the word and keep it, we must deny ourselves and pick up our cross and follow our Crucified master. In order to be the disciple of the Lord, in order to listen to the Word in our heart, we must make space - a movement of self-denial, not only a denial of sin but a denial also of those things that dispose us to sin. We can only be filled with the riches of Christ if we are empty of ourselves. Filled with ourselves, drunk on materialism, caught up our cleverness, tied down to our need for control or riches or security or reputation - there is no space for God to give us His Word or freedom to welcome this gift of love. And His Word laid open on the Cross is the true life of our hearts and only hope of this dying world. With the Word of the Father, the Word made flesh, we have everything. Without this Word of Hope living in our hearts and in our actions, we live without the meaning or purpose the Father created us to know. Indeed, without the Word who was from the beginning, all else is loss and can only end poorly. Our lives must begin and end in the Word entrusted to us by the Father, the Word who proceeds from His Heart, the Word who knows the way into our hearts, the Word who knows the only pathway into the Heart of the Trinity. To live by the Word of the Father, to live by the Truth Himself, means, in addition to self-denial, the acceptance of suffering for the sake of love - this is a life covered and filled with the blood of Christ. Love suffers the hardships of others - our spouse, our children, our parents, our neighbors, even our enemies - because love cannot stand for the beloved to suffer alone. Love raised up by the blood of Christ suffers rejection and being misunderstood because it is more powerful than persecution. Love never gives up hope because the blood of Christ is its strength. But for a Christian to try to love without Christ, for a Christian to try to live without the Cross- love unsurrendered to God leads to disaster. As Pope Francis explained in his first mass with the Cardinals who elected Him: "When we walk without the Cross, when one builds without the Cross, and when we confess Christ without the Cross, we are not the disciples of the Lord by the servants of the world."